This week brings us one of the most significant astrological aspects of the year, a New Moon Solar Eclipse in Leo. If, like me, you have this eclipse in a sensitive area of your chart, you are feeling it already. In fact, you’ve been feeling it since this series began in February, and the story that is unfolding in your life will continue for another year, until we enter a new series of eclipses in Capricorn and Cancer. Eclipses occur in sign pairs, determined by the position of the lunar nodes. The North Node currently is at 18 degrees Aquarius, with the South Node opposite at 18 degrees Leo. This week’s eclipse, which occurs Friday at 3:12 a.m. on the West Coast of the United States, falls at 9 degrees Leo, making it a South Node eclipse. Anyone with planets or chart angles between 4 and 14 degrees Leo or Aquarius will feel this eclipse the most, but you’ll also feel it if you have planets or chart angles between those degrees of Scorpio and Taurus. Eclipses tend to bring rapid change into our lives, faster than is comfortable for us. This is especially true for the fixed signs (Taurus, Leo, Scorpio, Aquarius). It’s said that the fixed signs fight change, but that’s not entirely true. That would be like saying that a rock fights change. We are so solid that change is extremely difficult for us. Even Aquarius, the air sign ruled by the Uranus, planet of sudden change and revolution, has a hard time getting into a new groove, as much as we usually want to. 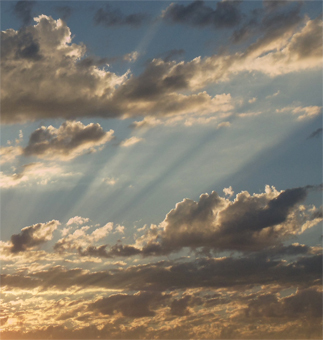 New Moon eclipses typically are about new beginnings. In my case, at least, it appears that a relationship that began at the solar eclipse in Aquarius in February has reached a logical conclusion, and it either will begin again under different circumstances, or it will disappear, clearing the way for another that is viable and sustainable. The learning process has been painful but extremely enlightening, and there is a possibility that deep healing will take place. I’ve written previously on Real Astrologers and on my blog, The Pisces Chronicles, about the healing potential of the triple conjunction of Neptune, Chiron, and the North Node. Since eclipses are tied to the nodes, healing will be a major theme of Friday’s eclipse and even more so with the lunar eclipse on August 16, which will be conjunct Neptune. Neith will have more on the eclipses in a day or two. Otherwise, there’s not a lot going on this week. Venus is on the South Node today (Monday), and she’ll oppose Neptune on Thursday. Wounds surrounding love and body image may come to the fore. If so, let them out and take them for what they are. August 1 also is the Celtic cross quarter day of Lammas, which in many cultures was the first day of fall in the northern hemisphere. I can tell you that it feels like fall already here in the Pacific Northwest, where the angle of the sun is very noticeable. Please leave comments telling us how you are experiencing this eclipse. 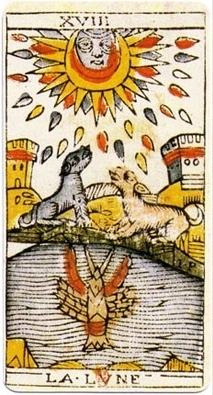 Image: The Moon, from the Marseille Tarot, c. 1701-1715. The classic interpretation of The Moon involves subconscious fears, hidden motivations, and the inexplicable compulsion for enlightenment. This entry was posted in About astrology, Forecasts, General Musing and tagged fixed signs, New Moon in Leo, solar eclipse on July 28, 2008 by Pat.